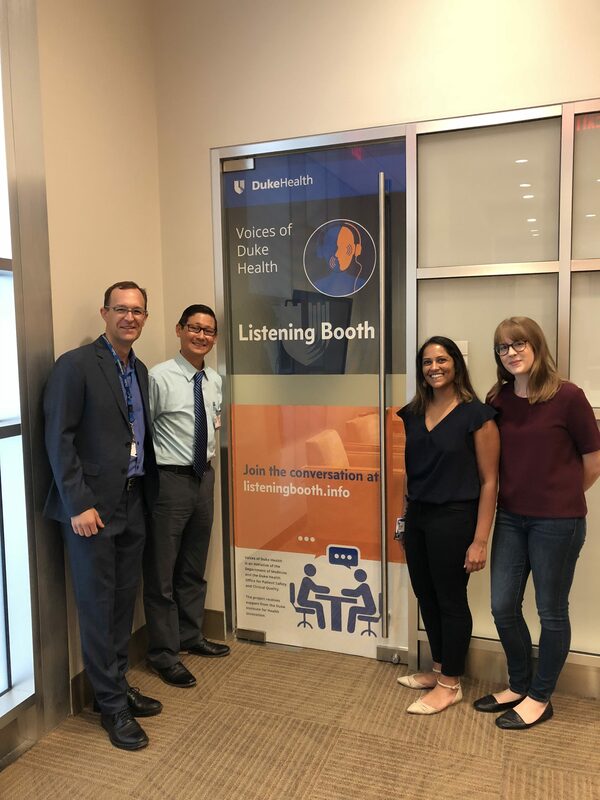 The Voices team — Karishma, Anton, Jon, and Susannah — sat down in the listening booth to introduce ourselves and have a conversation about what we hope Voices of Duke Health can be for our colleagues across Duke University and Health System. Anton Zuiker: Hi, my name is Anton Zuiker. I work in the Duke Department of medicine as the communications director. I’ve been at Duke for 11 years now and I just love working here and seeing all the people, and the patients, the doctors, the nurses, the students, the trainees, the researchers, the research staff. I have a great job as a communicator to walk the halls and hear people’s stories and to convey information and help information and news flow. And I’ve been real intrigued with stories and finding ways to capture more of the stories of the people that I see doing great work, working very hard here at Duke Hospital, at Durham Regional Hospital, at Duke Raleigh Hospital, and all the clinics and labs in between. So, we proposed a project called Voices of Duke Health. It’s a listening booth and podcast project. I’m real excited to be working with Dr. Jonathan Bae, who is the associate chief medical officer for patient safety and clinical quality for Duke University Health System. Dr. Bae is a great partner for this project and I wanted to ask him to tell us why he is part of this. Dr. Jonathan Bae: Thanks for that lovely introduction. You know, I’ve been at Duke for almost 13 years now and similarly have been struck by the amazing people that work here. And I think that really has come out through a lot of the stories that we get to hear about this place. One of my roles in the health system is to focus on patient safety and clinical quality. And as the patient is at the center of what we do, in order for us to take great care of those patients, we need to help take care of our care teams and focusing on the culture of safety, and to that end the well-being of our workforce is hugely important to us as an organization. So my role has been to think through strategies and ways we focus on that and this work connects me to that even more proximate to where the stories are happening, where the care is being delivered, so we can understand not just what those stories are but how we can improve ourselves and take better care of ourselves as we live through these stories. AZ: What does that mean when we talk about the stories of our workforce and of our colleagues? JB: Duke is such an amazing place and I think we take for granted that miracles are happening around us almost each and every day. I mean, we’re talking about the things that have happened just in the course of a single day here. You know, when I walk into the hospital as a provider I’m a hospitalist, I’m an internist. So that means I take care of patients on our internal medicine service here at University Hospital. You know, you are immediately stepping into the lives of patients. And to understand their own stories where what brought them here, what their trajectory is with illness, those are stories. And then there’s the stories of our care providers, what brought them to health care? It’s the stories of them intersecting with one another. It’s the stories of people coming together to do things together as teams to take amazing care of patients. I think all of these things together make up the story of Duke Health, and what we’re really hoping to do with this is to connect people to those stories that are happening around us. And in doing so better connect them back to our meaning and purpose for being here. AZ: The voices of Duke Health listening booth is going to be a space for conversations and this is where we will invite Duke Health providers, staff, students, trainees, patients, and even visitors to have one on one conversations about what is meaningful in their lives, their work, and their relationships. We plan to record these conversations and present the stories and discussions in a Voices of the Duke Health podcast so that everyone can learn and be inspired. JB: We’re thrilled to have a couple different team members here with us. I certainly am very grateful that Karishma Sriram is with us. She is a medical student here at Duke University School of Medicine, and is joining us, and has kind of an interesting path to joining this project and I’d like her to take a moment just to introduce herself and talk about that path. Karishma Sriram: My name is Karishma Sriram, I’m a second year medical student here. Born and raised in Athens, Georgia, went to the University of Georgia—go Dawgs—and made it up here to Duke University for medical school last year. I got interested in narrative medicine actually for a little while now, since my experience on a study abroad in Bolivia actually, and coming up here I’ve just found incredible mentors who have also had a passion for narrative medicine. And so I’m really excited to be a part of this project and I’m really excited to lead those conversations with anyone and everyone who comes to join the listening booth. So this podcast is going to be able to be streamed on computers and phones alike and you’ll be able to hear all these stories from nurses, physicians, patients, and everyone in between, to get a little bit of insight into what brought them to this hospital. JB: Yes. And I think, you know, we’re a team together. You know, we all come from our own backgrounds, but we unite behind a singular purpose that is to provide extraordinary care to our patients. And I think that, again, bringing those people together through storytelling, so you can gain different perspective on what a patient is going through, or what nurses are going through, what a doctor, what a food services person going through—all of those people have a perspective and storytelling gives us a way to connect and understand those points of view. So it’s, there’s all kinds of ways to explore this that I’m super thrilled about. AZ: So let’s introduce another team member, Susannah Roberson. We’ll ask her to come and sit down with the microphones and tell us about herself. Susannah Roberson: I’m Susannah Roberson and I graduated from Duke undergrad in 2016, and many years before that I was actually born at Duke Hospital. So it’s kind of fitting that I’m able to continue to be involved in the Duke story. I am the sound engineer of this project so I’ve been behind the scenes, messing with the soundboard and making sure everyone sounds good. So that’s been fun for me because that’s something new. I have lots of experience in producing and reporting but that’s a new side of it for me. So I’ve enjoyed learning how to do that. I love being a journalist because I’m able to learn about so many different things that I probably wouldn’t know that much about otherwise. And right now, I am interviewing former Duke Internal Medicine chief residents. And it’s been really interesting hearing about the ins and outs of the chief residency and of their experiences in medicine. And while their experiences may be pretty different from mine, career wise, I find it really striking that in these conversations we’re having, there’s always something that I can relate to. And I think that’s kind of the power and the magic of audio storytelling is, you know, you could be anywhere in the world and hear someone talk about their lives and their experiences, and they may lead lives that are very different from yours. But it kind of reminds you that we’re all a part of the human experience and share that common humanity. So I really love audio storytelling and I’m really excited to be doing so with this project and I can’t wait to see where it goes. AZ: Well I’ve enjoyed this introductory conversation with our team. We’ll be joined by others throughout the course of this pilot project. I’m looking forward to what we put together. Karishma will be a voice of the podcast, Susannah is going to help us really make it sound good, and maybe at the end, John, you and I can sit down and talk with this group and talk about what we learned at the end of this project. JB: I would love that, I suspect we have all kinds of surprises in store, most of which we can’t predict. AZ: The Voices of Duke Health Project does receive support from the Duke Institute for Health Innovation. We are grateful to DIHI for the innovation grant that they have given us to do this pilot project for the next few months. SR: Theme music was composed by William Dawson, musician-in-residence at Duke University Hospital, and produced, arranged, performed, and recorded by Mark Simonsen and Jack Fleishman. KS: To learn more about voices of Duke Health and sign up to have a conversation in the listening booth, visit www.listeningbooth.info.